When it comes to contemporary menswear and style, the names don’t get much bigger than Mark McNairy and Ronnie Fieg (that’s why we’ve featured them on our covers, here and here, duh). So it’s super exciting to hear that the two NYC based heavy hitters are joining forces on a collaborative project… and unfortunately that’s all we know about it for now. 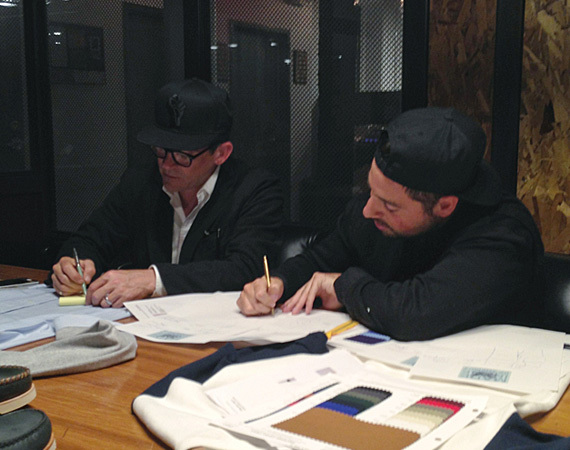 The image above of McNairy and Fieg signing off on some business agreements is the only thing that has been revealed about the project, but we’re gonna hazard a guess that it’s gonna be footwear related. Fieg has commented on the partnership saying: “This collaboration with Mark will change the game, the main reason we got together in the first place.” Maybe you can quiz him about it further when he’s out here next week for CARBON festival (still time to cop tickets, plug plug plug).